My ever questioning kiddo started asking me all sorts of questions about volcanoes today so we decided to have an impromptu volcano day. We watched a few videos of volcanoes at Kids Learning Videos, especially ones that had footage of lava flowing which is what most of his questions were about. 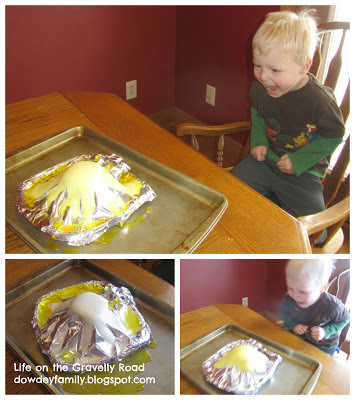 Then we used these directions for making an easy volcano at home. We had so much fun! I loved the idea from the site above of making the volcano from a plate plus small container/cup covered in foil (in a pan). It made for super easy clean up. My little helper dissolved the tablespoon of baking soda into the two tablespoons of water (with some food coloring added, though we were out of red). 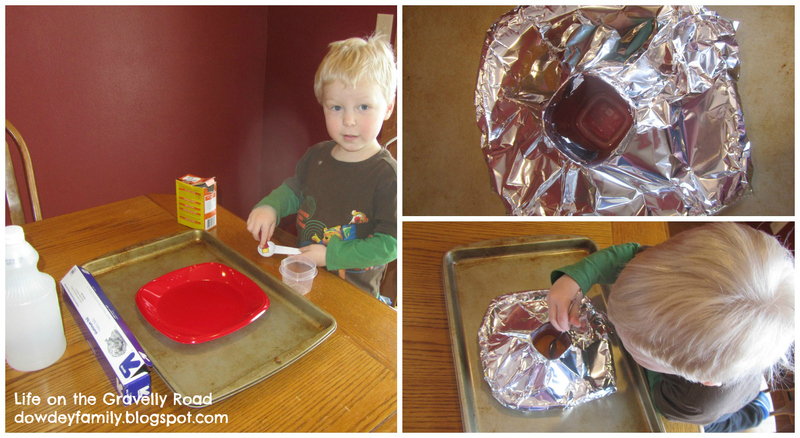 I added the two tablespoon of vinegar.... and then we added more because it was so fun! He thought it was so amazing! I was so glad we had nothing on our schedule so I could say "yes" to learning a little more about volcanoes! Fun with the Letter "L"